Sophie and Adam’s destination wedding at the exclusive White Orchid Beach House in Maui, Hawaii on February 21, 2017. We got the chance to meet with Sophie a few months before her wedding. Meeting with brides before the wedding is always such a treat for us because we don’t always get the chance since most couples are planning everything from the mainland. Sophie and Adam decided to book all three of our family of companies for their event, Sol Maui Events – DJ And MC Services, Aloha Bars Maui – Boutique Cocktail Catering and Luxury Photo Mirror – Photo Booth. DJ Del Sol of our sister company Sol Maui Events was the MC and Dj for the evening. The Groom and DJ Del pulled off a surprise for Sophie. Before anyone got to the venue the Groom and Del had a private rehearsal of a song that the groom Adam was going to play keyboard for and sing to his soon to be wife. She was so surprised when he sang this to her after dinner. We were all in tears! It was such a sweet moment. Sophie’s theme was Vintage soft colors. Our Vintage Dream Bar from our Aloha Bars Maui collection perfectly complimented her design. It was placed just feet away from the ocean and lava rock surrounding the property. 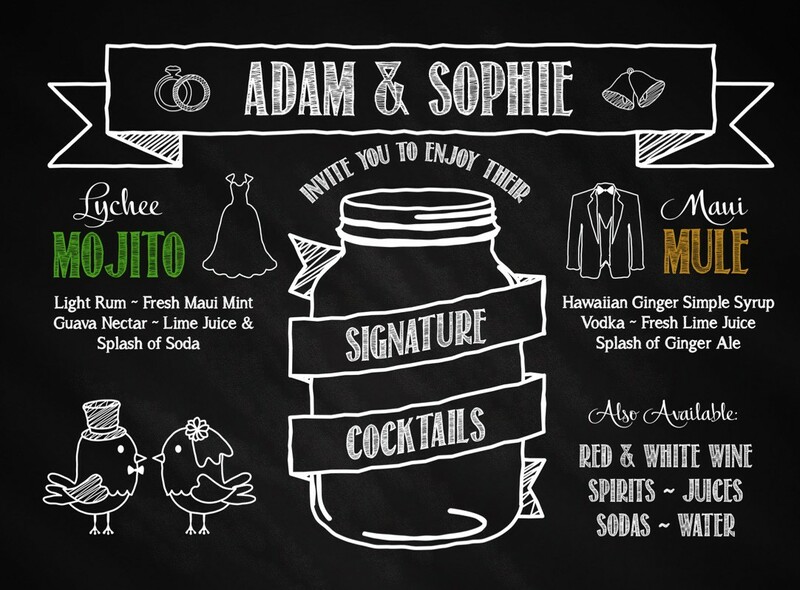 For The Bride and Grooms signature drinks we recreated Lychee Mojitos that the couple had had while on a vacation in Bali together. The ingredients were – Lychee (Asian Plum) Juice ,Fresh, Mint Lime and Rum. They also had Maui Mules – Vodka, Lime, Handcrafted Hawaiian ginger simple syrup and a splash of pineapple. We serve it with a splash of pineapple juice. The Guests absolutely loved the signature drinks and the unique flavors that they were able to experience. For our Luxury Photo Mirror Photo Booth we kept the vintage theme with a soft Pink Rosette backdrop from our collection. The photo border was a white wood wash design complimented with Pink text to tie everything in together. Everyone had a blast taking pictures throughout the night in the photo booth. Even though there were only 30 guests at the wedding the photo booth was busy non-stop. The pictures that we took that night were absolutely priceless.